The rent at The Palisades Apartments ranges from $1,134 for a one bedroom to a $1,339 two bedroom. Apartments in this building are about 9% less expensive than the Downtown average. This is a pet-friendly apartment. The Palisades Apartments is a seven minute walk from the Capital LRT Capital Line and the Metro LRT Metro Line at the Bay Enterprise Square Station stop. This apartment is in the Downtown neighborhood in Edmonton. Nearby parks include Beaver Hills House Park, Nellie McClung Park and Kinsmen Park. The Palisades Apartments has a Walk Score of 85 out of 100. This location is Very Walkable so most errands can be accomplished on foot. The Palisades is a quiet adult preferred high-rise building with beautifully upgraded suites, perfectly located in Downtown Edmonton. Just north of 97th Avenue and south of Jasper Avenue. 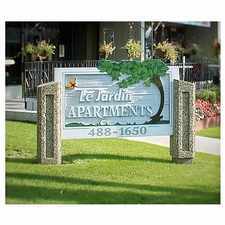 Providing a wide range of conveniences and experiences all within walking distance. Call The Palisades your next home. More about 9820 104 St. Explore how far you can travel by car, bus, bike and foot from The Palisades Apartments. The Palisades Apartments has excellent transit which means transit is convenient for most trips. The Palisades Apartments is in the Downtown neighborhood. Downtown is the most walkable neighborhood in Edmonton with a neighborhood Walk Score of 91.